Coyote Shootout Orlando - F150 5.0 Class! - Ford F150 Forums - Ford F-Series Truck Community. Coyote Shootout Orlando - F150 5.0 Class! Finally there is an event that includes F150s! Coyotes only. (sorry ecoboost guys). Get the family together and make a trip to Orlando, Sunday November 23rd. These events don't happen because they think nobody will show up. Let's change that and make the turnout good enough to keep it going. Cash prizes and give-aways, more info and details to come. 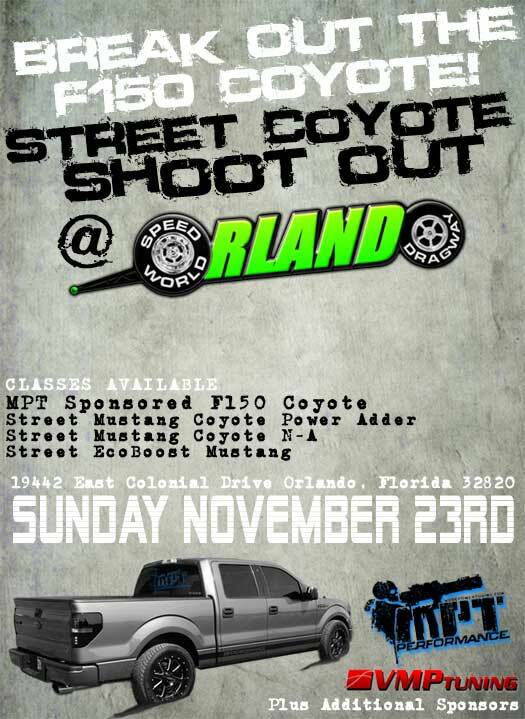 F150 coyote shootout drag race in Orlando November 23rd. Coyote Shootout is back in business.